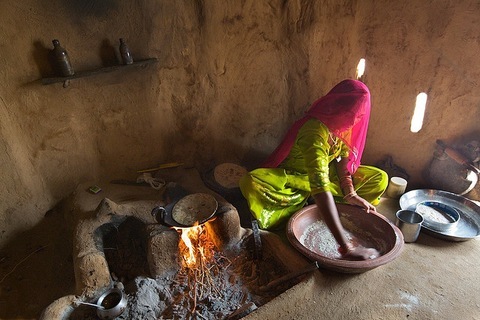 Cooking roti in India. Photo by Flickr user Michael Foley. A woman rises at dawn to prepare food for her family, building a small fire inside the house and frying bread on a makeshift stove above it. Some variation of this scene is repeated in millions of homes each day in low- and middle-income countries where modern cookstoves are scarce. But what many of these families don’t know is that by burning wood, dung or other biomass fuels inside they are putting their own lives — and lungs — at risk. Nearly two million deaths could be prevented each year by replacing cooking fires and inefficient, smoky stoves, reports a policy analysis by leaders from the National Institutes of Health published in Science Thursday. Smoke exposure inside the home can cause respiratory diseases, lung cancer and pneumonia. These cooking methods are the leading cause of environmental death around the world, according to the World Health Organization. “This creates levels of air pollution in homes that are astronomical, hundreds of times more than what you might breathe in New York, for example,” Neil Schluger, chief scientific officer at the World Lung Foundation, told the NewsHour. The health risks of cooking fires hit women and children particularly hard because they tend to work inside the home during the day, increasing their exposure. An international public-private partnership started by the United Nations Foundation, called the Global Alliance for Clean Cookstoves, has formed to try to create a market and demand for newer stoves. But reaching its goal of 100 million homes adopting cleaner stoves — which use electricity, solar power or a range of clean fuels — by 2020 will be challenging, the authors said. “There are many competing needs for those in extreme poverty, and awareness of the risks posed by cooking methods is limited,” they wrote. The campaign is trying to build a market for the products instead of distributing them for free, because many health efforts have found families ascribe more value to an item if they have to invest in it. But once new stoves are in the right hands, there will be a widespread need for education about the best way to cook with them. “You could give the most advanced stove to a family and if they use as their fuel leaves or twigs … you will still get a smoke bomb,” said William Martin, one of the authors and the associate director for prevention research at the Eunice Kennedy Shriver National Institute of Child Health and Human Development. There is also still uncertainty over the level of emissions reductions needed to improve health, and if the current campaign will help achieve that, says NIH. The authors estimate the costs of a necessary research program at between $150 million to $200 million. Despite these costs, Dr. Francis Collins, director of the National Institutes of Health, told Science that the huge burden of death caused by indoor pollution is a call to action. “Now that we’ve realized the huge impact in terms of lives lost, we all — I think — are going to be held responsible to try to do something about it,” he said.